High expectations to take care of a church in crisis have fallen on the shoulders of the newly elected Patriarch of the Syrian Orthodox Church, Afrem II Karim. Many also hope that he will “sweep out” the groups that have infiltrated the church and use it for their political purposes. But the future will show us if he is willing to take the bull by the horns, Journalist Augin Kurt Haninke writes. In this review, he also summarizes Patriarch Karim’s conduct towards the Assyrian Orthodox Church during the time he was the Bishop of the Eastern United States. In my last article about the schisms of the Syrian Orthodox Church, I showed how hostile regimes for decades have infiltrated various Assyrian churches in order to destroy the Assyrian national identity. I explained how three former patriarchs, who had been Assyrian patriots when they were bishops, turned and worked against the Assyrian heritage. As of this writing, it has been a few weeks after Patriarch Karim was elected to the Church’s highest office. Thus, as a patriarch, he is like a blank slate. We as members of the Church may have our expectations, but reality may be different in the end. However we can already summarize his actions as a bishop in the U.S. against two churches that continued to use the name Assyrian Orthodox Church. We can also point to some statements that he has made as the newly elected patriarch, which may be signs of things to come. Before we continue I would like to answer my previous question whether the Syrian Orthodox Church will split after the election of a new patriarch? That did not occur since those who may have had thoughts about “breaking” with the church; appear to be happy with the choice of the new patriarch. 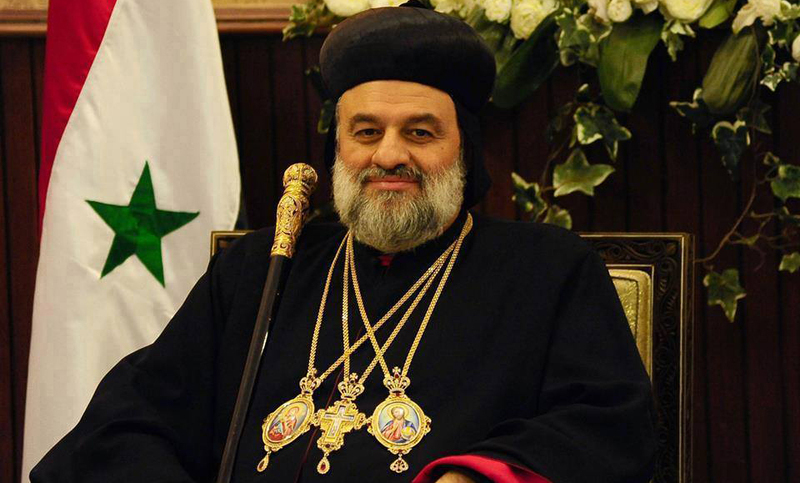 Some analysts speculate that the Syrian Baathist regime has had Bishop Karim as its favourite for the last two years. This is because Aleppo’s Bishop Yuhanna Ibrahim had begun to criticize the regime in diplomatic terms. By that time, the opposition had a tailwind and the adaptable Bishop Ibrahim, whose fate is still unknown, began to make overtures in the opposite direction. On April 22, 2013, he was kidnapped on his way home to Aleppo from the Turkish border. What is of special interest in this matter is that the first checkpoint he passed, the Free Syrian Army guards saluted and allowed the bishop’s car to pass, This according to Fuad Elia, a passenger in the same car who escaped the kidnapping drama. Further along the way, Bishop Ibrahim’s car was stopped by a group belonging to a Caucasian psycho called Abu Banat who had instituted Sharia law with a Muslim court. This Islamic ”court” imposed the death penalty for ”infidels” or cut off the fingers of those who smoked. This is a long story which I need not go into further, because our topic is the new Patriarch. As for the kidnapped Bishop Ibrahim of Aleppo, he had long been regarded as the foremost candidate for patriarch, but after his mild criticism of the Assad regime, he was apparently no longer the favourite. The same case is with the bishop of Gozarto [al-Jazeera] Matta Rohem, who also began to criticise the regime and left Syria for Austria. The choice seems to have fallen on the Bishop of the Eastern U.S, Afrem Karim, who harshly criticized President Obama in the American media last summer, when the U.S. threatened military action against Syria. The bishop pointed out that the government was the guarantor of the Christians in the country and added what has happened to the Christians in Iraq was a horrible scenario. He as a Christian from Syria did not want the United States to militarily attack the country. Here it is also important to point out that the bishop’s position is not unique in any way. The majority of the religious leaders from Syria are of the same opinion. Many others as well see the regime as a guarantee for the continued existence of Christians in Syria. At one point during a televised interview, the host asked if Bishop Karim himself comes from Syria to which the bishop replied that he is a Syrian citizen of Syriac-Aramaic origin. Much of the information on social media indicates that Bishop Karim had visited President Bashar al-Assad in Damascus about a month before the death of Patriach Zakka Iwas. If true, it was probably in preparation for taking over the patriarchal office. On March 31, 2014, Bishop Karim was elected as patriarch by the Synod in Lebanon, just three days after the deceased Patriarch Zakka was buried in the Damascus suburb of Sednaya. All who had expected a “hard fight” for the post of patriarch were surprised that it went quickly and smoothly. According to the Assyrian activist Suleyman Yousuf in Syria, before the Synod convened, Bishop Samuel Aktaş of Turabdin, was asked if he thought that Bishop Karim would be selected. He replied: “Why not? Bishop Karim meets all the criteria. He is educated, speaks several languages and is very well aware of the conditions both in the Middle East and in the diaspora”. Yousuf and other analysts interpret this as meaning that the election was “rigged”. It is not surprising that the Syrian regime would have its own candidate for patriarch. It has planned for it for several decades and may have succeeded now. Despite the great turmoil in the country, the Assad regime seems to maintain its strong influence over the Syrian Orthodox Church. The Aramaic faction’s candidate was most likely Bishop Eugene Kaplan of California, but he received half as many votes as Bishop Karim. What role the Turkish security MIT played is less well known, but a colleague who was present at the mourning in Germany states that MIT was so active that many got the impression that Istanbul’s Bishop Yusuf Çetin would be the next patriarch. Only two days after the Synod meeting, Patriarch Karim made his first visit to the presidential palace in Damascus to meet with President Assad. On this same day, he also made his first visit as patriarch to the patriarchal headquarters in Bab Tuma in Damascus’s Old City. He was welcomed by the usual chorus ”To bashlom, ro’yo shariro” (Welcome, true shepherd!). Seated upon the patriarch’s chair at the altar of the church, he held an impromptu speech in Arabic in which he thanked President Assad and wished him success in building ”the new and our beloved Syria”. Here there is no difference between him and his predecessor Patriarch Zakka who frequently praised the country’s president. When the Christian world celebrated the 2000th anniversary of Jesus’ birth, Patriarch Zakka preached that God had sent President Hafez al-Assad as a saviour to Syria and that Jesus himself was from Syria. He was referring to Palestine which was the Roman province of Syria at the time of Jesus’ birth. Thus, Patriarch Karim continues in his predecessor’s footsteps by praising the country’s rulers from his first day. But this does not rule out that he could not repair the damage that Patriarch Zakka has done to the Church, for exemple by encouraging its rich cultural heritage, such as the language. All bishops and patriarchs tend to point out that our language is venerable and holy, but in reality, most have turned a blind eye to Arabization which has taken a stranglehold on the church’s liturgy. Patriarch Karim is said to be the first patriarch in more than 700 years who speaks the Assyrian language, Surayt, as his mother tongue. If we deduct 475 years because Turabdin had its own patriarchate and those patriarchs are not among the official patriarchal list, there still remains a couple of centuries in which the patriarchs in the Syrian Orthodox Church came mainly from Nineveh (Mosul) or other Assyrian cities, with greater educational level. Turabdin was, after all, a poor agricultural area isolated from the outside world. Nowadays, there are several bishops from Turabdin and therefore, Surayt speakers. Patriarch Karim’s family name is Be-Sohdo, and they are originally from the village of Ehwo (Hbob) in the Izlo Mountain in Turabdin, Turkey. He was born in 1965 in the city of Qameshly in Syria and is the youngest child of the family. His given name is ”Sa’eed” but as a child, was often called ”Qasho” (priest) by his friends; one of his relatives informed me. He added that the patriarch was always in church during his childhood. At an early age, little Sa’eed lost his father Issa Karim in a car accident and the widow Khanime worked hard to give her seven children the best upbringing and education that was possible with her ​​meager resources. In 1977, he was admitted to the St. Afrem Seminary (where he got the name Afrem) in Atshaneh, Lebanon. Now he has been elected to the position of patriarch at the same church in Lebanon (the official installation takes place on Holy Cross Day, Sept. 14th). He has studied in both Egypt and Ireland earning a Ph.D. from St. Patrick’s College. The subject matter of his thesis was the significance of the Cross as a symbol for the early Christians. In 1996, he was ordained Bishop of the Eastern United States. The former diocese of North America and Canada was divided into three. Bishop Karim headed the eastern United States with headquarters in New Jersey, Bishop Kaplan was given responsibility for the western United States with headquarters in Los Angeles and Canada got its own bishop. What is of interest to us is Bishop Karim’s actions in the case of the Assyrian Orthodox Church in Shrewsbury (the original church in Worcester had been sold by this time), Massachusetts. It is one of the oldest among the Assyrian churches in the United States. In 1923, the relatives of Ashur Yusef from Kharput began the construction of the church in Worcester. It was completed in the summer of 1925 and finally consecrated on April 22, 1928 by Bishop Afrem Barsom (Donabed: Remnants of Heroes, pp. 74-82, Chicago 2003). In 1953, the then Bishop Yeshu Samuel of the United States and Canada (who visited to US in 1947 in order to sell the Dead Sea Scrolls, then refused to go back to his diocese in Jerusalem) initiated an intense battle to change the name of the churches from Assyrian to Syrian. He succeeded with the church in Rhode Island (Central Falls, consecrated September 25, 1927), but failed with two others. The one that continues to bear the name Assyrian is located in Paramus, New Jersey (originally West New York, consecrated on September 18, 1927). The order to change the churches name to Syrian Church had come from Patriarch Afrem Barsom who himself had consecrated all three churches during his visit to the United States in 1927-28 with their Assyrian name. In the U.S., different Assyrian communities, both Nestorian and Jacobite and some Chaldean churches, were called Assyrian. The senior members of these churches had good relations across denominational boundaries. The Presbyterian minister and Assyrian patriot Joel E. Warda preached in St. Mary’s Assyrian Apostolic Church in Worcester during a mass held on August 1925. Five years earlier, he had been a member of the delegation that represented the Assyrians in the United States at the Paris Peace Conference in 1919. The reason that Naum Faiq and other Assyrians in the United States called their churches Assyrian was that Assyrian was their ethnicity and they were proud of their identity and heritage. Another reason was that some of the Arab Christians of Syria, namely Melkites, used the name Syrian Orthodox Church in the United States at the time. The West Assyrian churches in the United States were initially called Assyrian Apostolic Church, but this was later changed to Assyrian Orthodox Church. At the end of 1952, Patriarch Barsom decided that Assyrian would be replaced by Syrian and Bishop Samuel would enforce the decision. In a letter dated February 6, 1953 to the parishioners, Bishop Samuel informs them about the reason for the change. He uses the Assyrian name for the people, although the name of the church in the future would not be called Assyrian (Donabed, 79). Bishop Samuel began the process by taking the matter to court in order to take over the name Syrian Orthodox Church from the Syrian Arab Christians. He succeeded and made sure that his church was the only one in the Middle East who was allowed to bear the name Syrian Orthodox Church in the future. Turning his attention to the churches in the U.S. known as the Assyrian Orthodox Church, Bishop Samuel met unexpected resistance from patriotic Assyrians who originated from Omid (Diyarbekir) and Kharput in today’s Turkey. Patriotic enthusiasts like David Barsum Perley and Rose Dartley won a U.S. court decision that held that as long as there is a single member of the church in Paramus who calls himself Assyrian, nobody could change its name to Syrian. When Bishop Samuel saw that he could face a similar court ruling in Worcester, he persuaded the parish to withdraw its lawsuit. In return, he promised that the Church would retain its Assyrian name. In 1958, the new Patriarch Yakub III made his first visit to the U.S. and South America. There he promised that the churches would retain the Assyrian name. Farid Nazha, the publisher of the Assyrian journal Hdonoyutho Suryoyto (in Spanish Asociacion Asirio) informed his readers of this decision in volume 24, May-June and July-August 1958 issue. He also added that by the time there were around 100.000 Assyrians living in South America. Nazha was a good friend of Patriarch Yakub and twice had invited him to dinner at his home in Buenos Aires, Argentina. In his discussions with the Patriarch, he called Bishop Yeshu Samuel “the bishop who lost his mind” (in Arabic: Matran al-Makhlu’) who did not understand the meaning of the term Assyrian. Because Patriarch Yakub was new to the post, he wanted peace in his church and decided to ignore the decision of the Synod which a few years earlier (during the previous Patriarch’s leadership) demanded a change in the name of the church to Syrian. The Assyrians in the United States were thus allowed to keep the name Assyrian Church for the remaining two churches. On October 26, 1960, Patriarch Yakub wrote a letter to the Assyrians in Worcester confirming his promise that the church would be given a dispensation to retain its Assyrian name. He also urged the congregation to cooperate with Bishop Samuel on the same terms as the congregation in Paramus (Donabed, 80). In 1980, Patriarch Yakub passed away and was succeeded by Patriarch Zakka Iwas. In 1995, Bishop Yeshu Samuel passed away. The following year the monk Afrem Karim, the current patriarch, was ordained a bishop and stationed in New Jersey as patriarchal deputy. He resumed his predecessor’s old struggle against the Assyrian Church. Parishes rebelled again. In Paramus it became more difficult to change the name of the church because there was a 50-year old court order. When the bishop wanted to proceed, Father John Khouri, (originally from the village of Miden in Turabdin) protested. He promised that he would testify in court that he is Assyrian. Thus the church in Paramus would retain its Assyrian name as long as Father John was alive. He brought the bishop to his senses by arguing that the church has in no way been hurt by calling itself the Assyrian Church in English and Suryoyo in our own language. Bishop Karim “backed off” in the case of Paramus but directed his attention toward the church in Shrewsbury. The congregation had previously planned construction of a new church, because the old one in Worcester from 1923 had become too small. They sold the old building in Worcester and built a new one in Shrewsbury that opened in 1994 under its old name St. Mary’s Assyrian Orthodox Church. This was before Bishop Karim had come to the United States. But now that he had taken up the fight against the name Assyrian Church, there was no court decision to lean on for the congregation. Many of the patriotic Kharput Assyrians who had built the church were no longer alive. Their grandchildren had now been joined by Assyrians from other areas who lacked the Assyrian national ideology. This was the reason Bishop Karim managed to replace the name of the church to Syrian Orthodox in 1998. (Donabed, 82). In 1999, prior to the U.S Census 2000, the Synod, at the request of the bishops of the United States, decided that the church would now be called Syriac Orthodox Church. The Church in Shrewsbury is now called St. Mary’s Syriac Orthodox Church. But most other Syriac Orthodox churches in the United States still retain their old signs, i.e Syrian Orthodox Church. A large number of members left the Shrewsbury church. Prior to that time, they had written to Patriarch Zakka or sent representatives to Damascus to ask him to intervene. They also proposed a direct connection to the patriarchate or to another diocese in Europe. But Patriarch Zakka was unable to do anything, because Bishop Karim accused him of interfering in the internal affairs of the diocese. Members who left the church, initially formed the Assyrian National Church but lacked a priest. Since 2007, they are connected to the secessionist Malankara Orthodox Syrian Church in India with Mushe Gürgün as their Bishop in the United States. He had also left the church because of internal conflicts with its management and joined the Malankara Church in India. Bishop Gürgün permitted the Assyrians living in the Worcester area to use the name St. Mary’s Assyrian Orthodox Church. Furthermore, 350 families, led by Father Joseph Tarzi, who were all banned by Bishop Kaplan in Los Angeles, also connected to Bishop Mushe Gürgün. This is what the new Patriarch Afrem Karim has accomplished in the United States. When it came to the Aramaic faction’s attempt to introduce their flag in the church, Karim had stated earlier as a bishop and in his first speech as patriarch that all factions are welcome in the church, but the only symbol the church accepts is the cross. Though he claims his identity as Syriac-Aramaic many receive his commitment to the cross as a sign of hope. But we don’t know if he will demand that all foreign flags be taken down from church buildings. Time will tell. The only thing we can do now is to wish him good luck and hope he does not forget his Turabdinian roots. If I were in his place, my first statement would read as follows: ”As the supreme leader of the Syrian Orthodox Church, I hereby disavow my predecessor’s statements that Arab blood flows in our veins”.